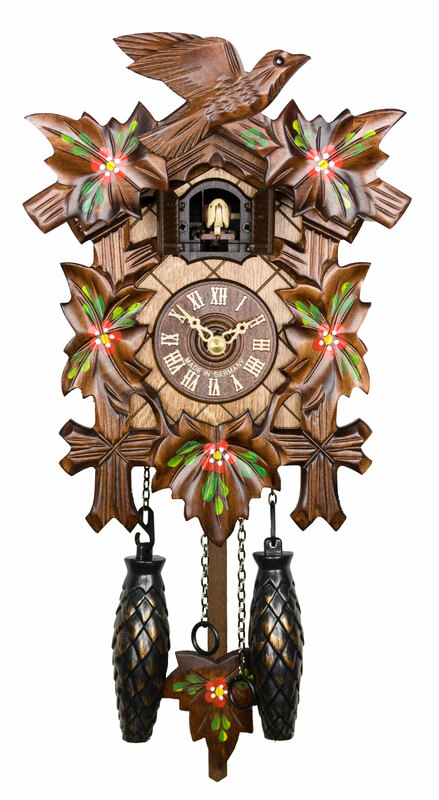 A traditional Black Forest cuckoo clock with prettily hand-painted spring flowers. The cuckoo calls on the hour and is followed by an echo and by one of 12 alternating melodies. The cuckoo and the music turn off automatically between 10.00 p.m. and 6.00 a.m. or they can be turned off anytime manually. The clock is personally signed at the back by the manufacturer Adolf Herr. His signature guarantees the experience of 6 generations of clock-workmanship. This clock comes with a certificate of authenticity (AHC). Battery operated movment with manual and automatic night-off (10:00 p.m. - 06: a.m.). The music can be turned off separately. Melodies: Ich weiss nicht was soll das bedeuten..., Oh my Darling, The Happy Wanderer , Horch was kommt von draussen rein, Im Frühtau zu Berge, Im gruenen Wald da wo die Drossel singt, Oh Donna Clara, Schwarzbraun ist die Haselnuss, Kuckuck-Kuckuck rufts aus dem Wald, Alle Voegel sind schon da, Waterwheel in the Black Forest. Ein Vogel wollte Hochzeit machen. wooden dial, diameter 2 3/8 Inches (6 cm).